Click here for our top 5 drones reviewed. When you think of the word “drone” do you see a picture of a miniature 4-rotor helicopter? This design dates back as early as the 1920’s, although this was for use in a full sized helicopter. “Drone” was coined by the public because of the similarity of the clunky navigation and loud buzzing of some of the older military unmanned aircrafts to worker bees. Our common term of drone is actually strongly opposed by professionals and government regulators. UAV, unmanned aircraft vehicle, is the more accurate term, and distinguishes it from other aircraft and airborne objects. A UAV as an aircraft or similar airborne vehicle that can fly on its own power, while either being controlled remotely or with pre-programmed instructions. It can be single-use or it can be one that lands and relaunched (after refueling or recharging). It can also be armed with weaponry (typically explosives or other deployable payloads). This differs from a missile because missiles carry a payload and inherently cannot be reused. Although further definition is required to differentiate UAVs from model aircraft, as it stands, model aircraft are considered UAVs, and are therefore also technically drones. Some would postulate that some form of autopilot AI or assisted flight AI should be included in the definition of drones. The definition of a drone isn’t precise, while the definition of a UAV is fairly clear-cut. 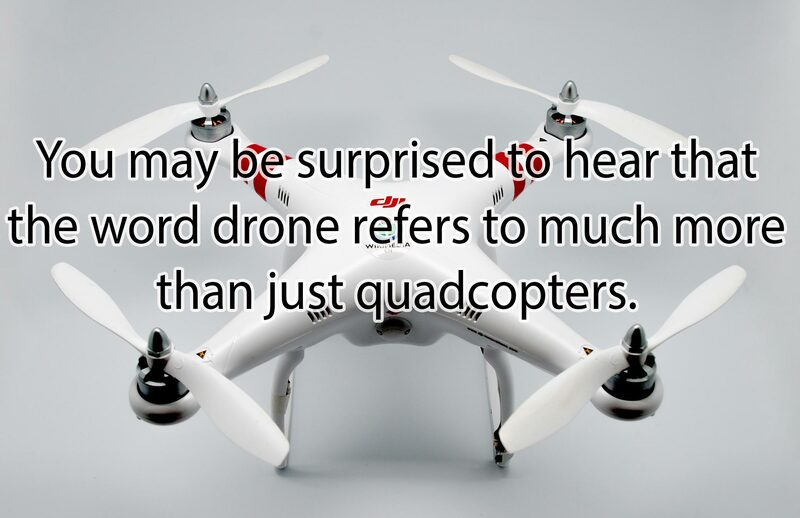 Most people, when referring to a hobbyist drone are referring to lightweight quadcopters. The Syma X5C is our pick for the best deal on the market right now, featuring popular stabilization systems and a basic package for photo and video shooting, all at an affordable price. Check it out here. The UDI U818A HD+ features a nifty return-home and auto-takeoff feature as well as the standard stabilization features. Read more about it here. DJI Phantom 3 Pro is the pinnacle of persoanl camera drones. Photographer grade quality, and multiple auto-pilot and assisted-flight features allow for effortless capture of stunning footage. Eachine Racer 250 - Our favorite pre-built quadcopter racer. It's incredilby fast and is superisingly inexpensive compared to similarly built racers. Find it here. Our favorite low-budget buy with a twist. The Cheerwing Voyager is a cool little UFO-style hex-copter drone, with a basic camera mounted on it, a cool barrel-roll button, and a return-home key. As far back as 1849 we see use of unmanned aircraft used in military applications. Austria sent bomb-filled balloons to attack Venice. From that point on unmanned aircraft were typically designed and used for training targets. In 1935, Reginald Denny developed a model airplane that was the first remote controlled scale model. The trend continues onward for military uses, while hobbyist development of scale model planes would take a few years longer to take off (ha). As early as 1959 the U.S. Air Force began official planning for development and deployment of unmanned aircraft. Within days of the Soviet Union shooting down a U-2 spy plane, the classified UAV program was under way. UAVs were seen in combat by 1964 during the Vietnam War. By 1970, drones with cameras were used, as well as drones that were used as decoys to trick enemy forces into wasting anti-aircraft missiles. 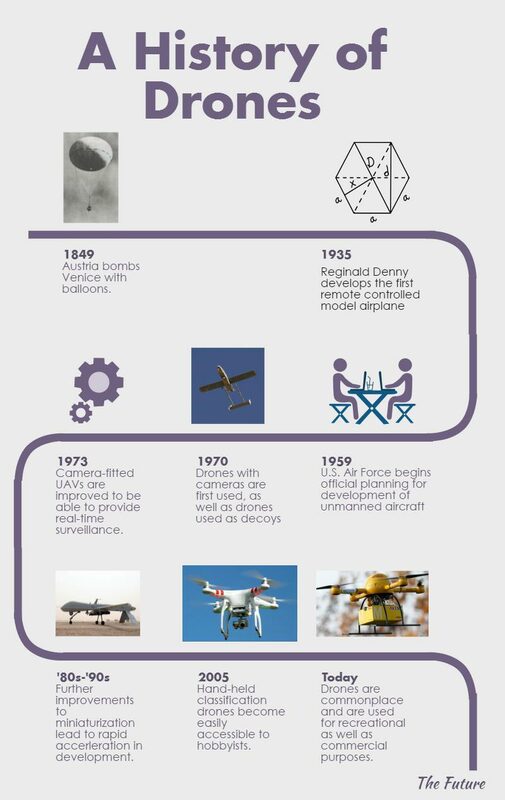 During 1973, camera-fitted UAVs were improved to be able to provide real-time surveillance. This was used to win an entire conflict without the loss of any pilots. Further improvements to miniaturization technology in the 80’s and 90’s led to a rapid acceleration in development in the military, and further reduction in price and size of the units, eventually leading to inexpensive hobbyist level models becoming available. By 2005, hand-held classification drones (ranges up to about 2km) were commonplace and easily accessible to hobbyists. Typical drones you see are classified as “miniature UAVs” which are any drone less than 25kg. Add this to your website! 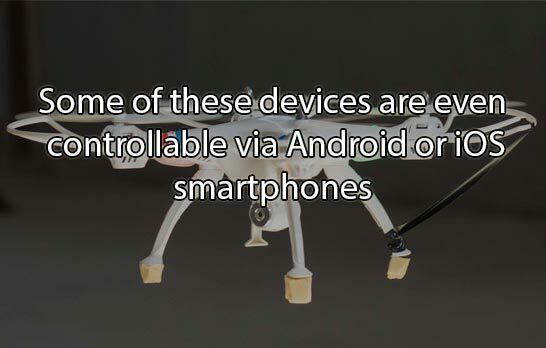 Some of these devices are even controllable via Android or iOS smartphones, making them incredibly convenient for quick aerial photo or video taking. Professionals in the motion picture industry can make use of higher end camera drones with exhaustive controls and settings to take studio-quality footage, and this is sometimes preferable to a helicopter and camera crew as it saves on costs. These drones have also been used to great success to expose illegal hunting, performing search and rescue, delivering medical supplies to otherwise dangerous areas, monitoring livestock, mapping wildfires, running pipeline security, home security, road patrol, and antipiracy. The future of drones is bright, with advances in technology every day. Introduction of sports such as drone racing using FPV drones and the development of virtual-reality headset gear (VR) allows for intense first-person racing action, with HD streaming from drone's forward-facing cameras. Improvements such as these will pave the way for the future of hobbyist drone usage, as well as the practical uses mentioned in this article. Perhaps soon, drone useage will be as commonplace as the cellphone has become!